"For whoever shall keep the whole law, and yet stumble in one point, he is guilty of all" (James 2:10). "by Jesus everyone who believes is justified from all things from which you could not be justified by the law of Moses" (Acts 13:39). In fact, Proverbs 21:2 declares "Every way of man is right in his own eyes, but the Lord weighs the hearts." Though most people believe they are heaven bound, what exactly is heaven's standard for good, moral and righteous? Who is righteous enough to enter? 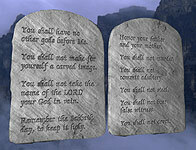 God has not left us in the dark - His Law (the Ten Commandments) reveals the standard we must meet. In fact, we are told that the Law of the Lord is perfect, holy, just and good. God has even revealed His Law to every human heart (Romans 2:15). Nevertheless, the Law cannot save us: "...by the deeds of the law no flesh will be justified in His sight, for by the law is the knowledge of sin" (Romans 3:20). God's Story: From Creation to Eternity is a 80-minute panorama of the entire Bible! This is an excellent overview of the plan of God from Genesis to Revelation. Narrated by Dean Jones, this life-changing summary of the Scriptures explains the Creator's plan for mankind. "So then faith comes by hearing, and hearing by the word of God" (Romans 10:17).